Two British members of the notorious Lulz Security hacking collective have pleaded guilty to a slew of computer crimes, in the latest blow against online troublemakers whose exploits have grabbed headlines and embarrassed governments around the world. Ryan Cleary is from Essex, United Kingdom who was arrested by Metropolitan Police on June 21 2011 and charged with violating the Computer Misuse Act and the Criminal Law Act 1977. He was accused of being a member of LulzSec but was not a member of the said group although he admitted that he did run one of the IRC channels that they used for communicating. 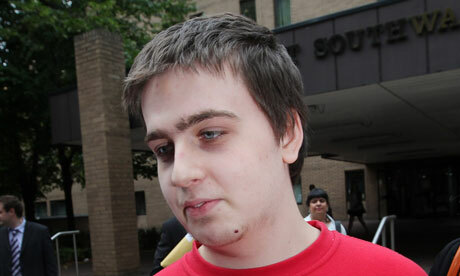 He also faces prosecution of joining other members of LulzSec in using hacked computers, known as a "botnet", to steal confidential information, deface websites or attack servers. Jake Davis, an 18-year old man suspected of being "Topiary" was arrested in the Shetland Islands on July 27, 2011. On July 31, 2011, the man was charged with five offences including unauthorised computer access and conspiracy to carry out a distributed denial of service attack on the Serious Organised Crime Agency's website. Scotland Yard later identified the man arrested as Yell, Shetland resident Jake Davis. Police confiscated a Dell laptop and a 100-gigabyte hard drive that had 16 different virtual machines. The hard drive also contained details relating to an attack on Sony and hundreds of thousands of email addresses and passwords were found on the computer. A London court released Davis on bail under the conditions that he live under curfew with his mother and have no access to the Internet. His lawyer Gideon Cammerman stated that, while his client did help publicize LulzSec and Anonymous attacks, he lacks the technical skills to have been anything but a sympathizer. The name Lulzsec is a combination of that internet slang word 'lulz' or 'lols', a distorted acronym meaning 'laugh out loud', and an abbreviation of 'security'. Davis admitted conspiring to carry out a “denial of service” attack on the Serious Organised Crime Agency.He also admitted hacking the NHS website.Cleary confessed to four charges, including hacking into US Air Force Agency computers, based at the Pentagon. The hackers repeatedly humbled law enforcement stealing data from FBI partner organization InfraGard, briefly jamming the website of Britain's Serious and Organized Crime Agency, and publishing a large cache of emails from the Arizona Department of Public Safety. But both denied two charges that they had posted "unlawfully obtained confidential computer data" to sites such as the Pirate Bay and Pastebin. Members of LulzSec and its reputed leader, known as Sabu, were some of the best known in the movement. But in March, officials in the United States unmasked Sabu as an F.B.I. informant named Hector Xavier Monsegur, and officials on both sides of the Atlantic arrested roughly half a dozen people who were suspected of collaborating. Alleged co-hackers Ryan Ackroyd, 25, and a 17-year-old A-level student, from south-London, deny their involvement in the attacks and will stand trial with Davis and Cleary in April 2013. One Man Fights for 7 Billion People "Wikileaks"